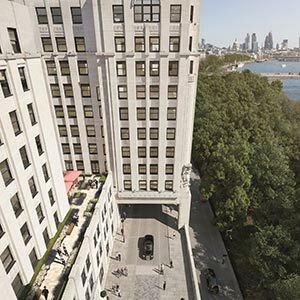 ISG has secured a £30M project with global investment firm Blackstone to remodel and refurbish six floors of the iconic art deco Adelphi Building, overlooking the Victoria Embankment in London. ISG will deliver approximately 190,000 sq ft of open plan office accommodation across floors one to six of the Grade II listed steel framed, Portland stone clad, 1938 built structure, which will be part occupied during the project. The scheme incorporates structural alterations to sensitively modernise the building, including the reinstatement of internal light wells to maximise natural light entering the structure at lower levels. As the upper half of the building will remain occupied, ISG will systematically replace all 10 existing lifts and introduce a further two lifts, while maintaining continuity of services to remaining tenants. The main reception area will be remodelled and new entrances introduced at levels one and three to enhance accessibility, while perimeter light wells at level three will be opened out to further increase natural light. The project also includes public realm improvement work, with new pedestrian areas, attractive hard and soft landscaping and a new landscaped roof terrace area overlooking the reinstated glazed light wells at level six. The project is scheduled for completion in summer 2015.